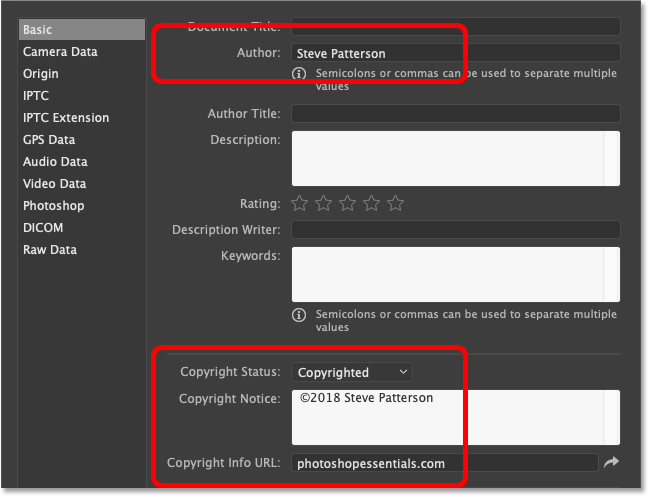 Learn how to protect and promote your work online by adding contact and copyright information to your images with Photoshop! Uploading images to the web is an easy way to share our photos with family, friends, and millions of complete strangers all over the world. But it also makes it easy to have those photos stolen or used without permission. Adding contact and copyright information before uploading your images won't put an end to the problem. But it will let honest people know that your image is copyrighted, and give them a way to contact you for more information. 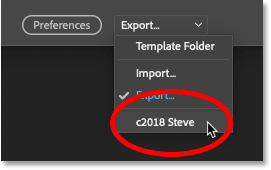 In this tutorial, I'll show you how easy it is to add your contact and copyright details in Photoshop. We'll start by adding the information to a file and saving it as a reusable template. Then I'll show you how to apply that template both to a single image and to multiple images at once! Let's get started! We'll start by creating a template to hold your contact and copyright information. 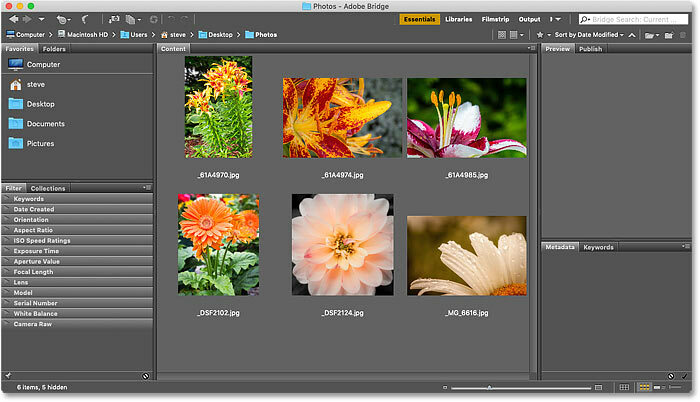 I'll then show you how to apply the template to your images, first to a single image, and then to multiple images at once. 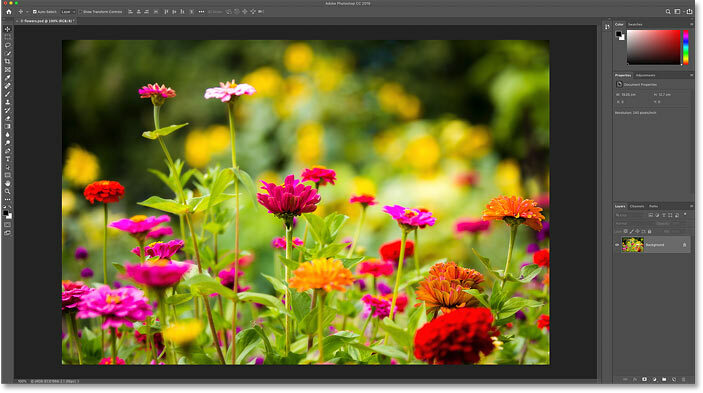 To follow along, you'll want to be using the latest version of Photoshop CC. 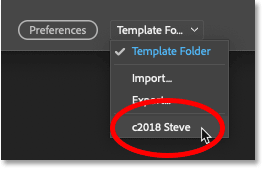 Creating a new Photoshop document. Any size will do. Going to File > File Info. The copyright details are found in the Basic category. Filling out the Author information. Changing "Copyright Status" to "Copyrighted". And then enter your copyright information into the Copyright Notice box. In most cases, all you'll need is the copyright symbol, the year, and your name. On a Windows PC, press and hold the Alt key on your keyboard and enter 0169 on the numeric keypad. On a Mac, press Option+G. Enter your website's URL and click the arrow to test it in your web browser. The template will include only the information that applies to all images. 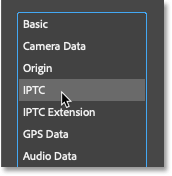 Switching from Basic to the IPTC properties. Pasting the website URL from the Basic properties. Enter as much (or as little) contact information as you need. Exporting the information as a template. The new template is saved. Clicking the Cancel button to close the dialog box. So now that we've created and saved our contact and copyright info as a template, here's how to apply it to an image. Opening an image. Photo credit: Steve Patterson. Choosing the contact and copyright info template. Clear existing properties and replace with template properties will clear all existing properties,	including those that are specific to the image (Document Title, Description, Keywords, etc). It will then add only your contact and copyright info from the template, leaving everything else blank. Generally, this is not the option you want. 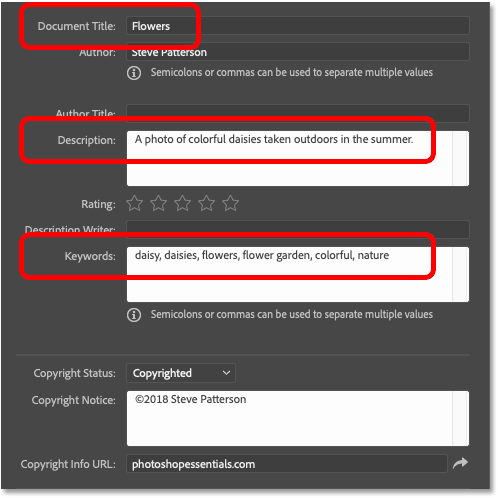 Keep original metadata, but replace matching properties from template will replace any existing contact and copyright info with the details from your template. Everything else (Document Title, Description, Keywords, etc.) will be left alone. 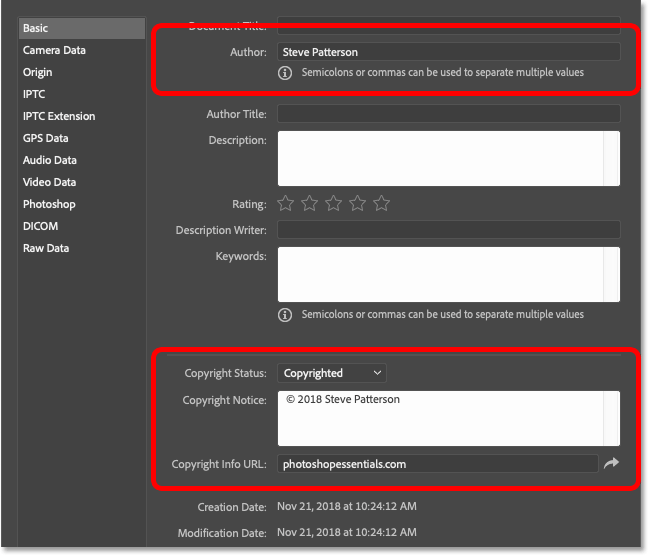 Keep original metadata, but append matching properties from template is similar to the previous option. But instead of replacing the existing contact and copyright information, it will keep any information that already exists and only add the details that are missing. For example, if your website URL was the only property missing, it would add only your website URL. Any existing details would remain unchanged. The third Import option is usually best. 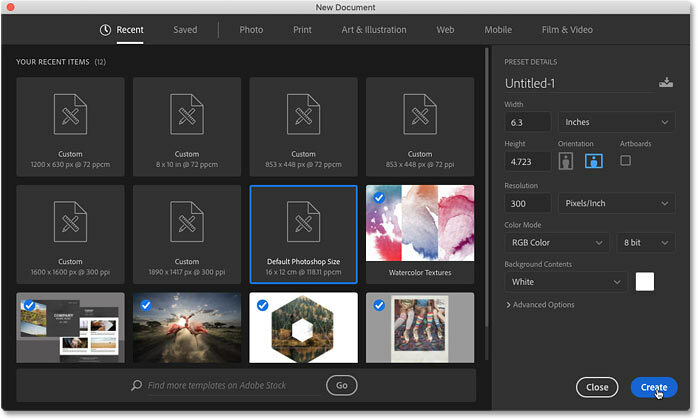 Adding image-specific details after loading the template. The small copyright symbol in the title tab. And then if you're done with the image, you can close the document by going back up to the File menu and choosing Close. 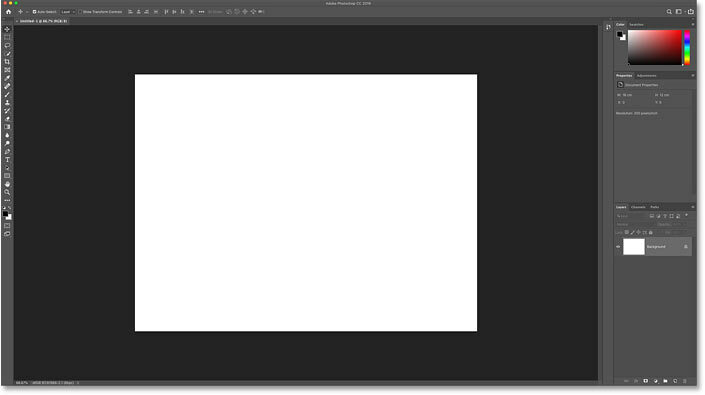 And that's how to add your contact and copyright info to an image in Photoshop! 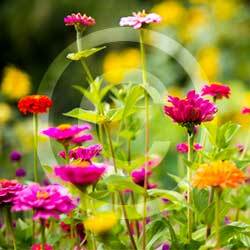 Along with adding your contact and copyright info to a single image, you can also add it to multiple images at a time. 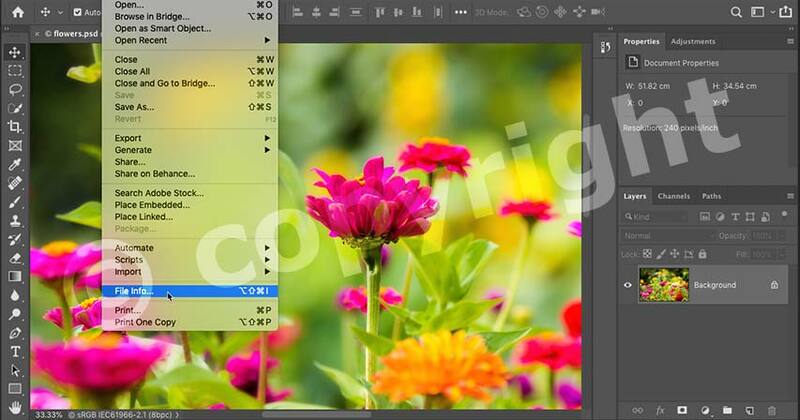 To do that, we use Photoshop's companion program, Adobe Bridge. And the advantage that Bridge has over Photoshop is that Bridge can add and update our information all on its own, without needing to open and save the images again in Photoshop. Navigating to the images in Adobe Bridge. Going to Edit > Select All. 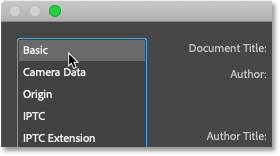 Selecting the "append" import option. The contact and copyright info is added from the template. Close the File Info dialog box to commit the changes. And there we have it! 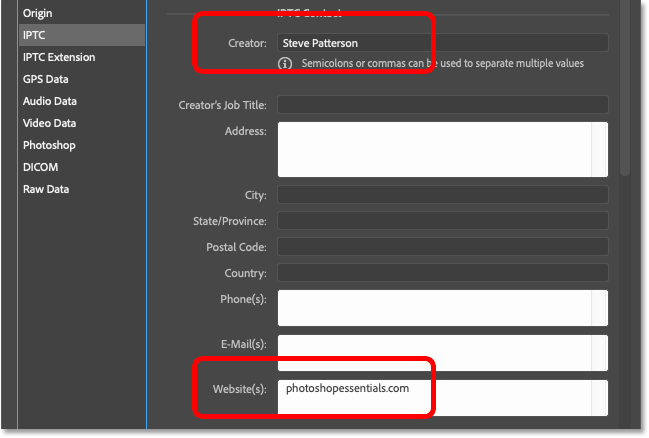 That's how to add contact and copyright information to your images in Photoshop! Check out our Photoshop Basics section for more tutorials! And don' forget, all of our tutorials are now available to download as PDFs!